I received a tin of Black Frigate and Haunted Bookshop today. Tried a bowl of the BF very good. I'm about to pair up some of the haunted bookshop with a cup of java. 2 ounces each GH Bob's Chocolate Flake and Best Brown #2. Last I heard, Tobaccopipes had 24 250g boxes of this blend in stock. Good price, too, with no sales tax. Heads up to the wise. Burley Flake 2. Two tins. Goose, I really wish I had your tobacco budget. Adam Z wrote: Goose, I really wish I had your tobacco budget. I only buy tobaccos I am absolutely sure I'm nuts about. And also ones I'm suspecting may, for whatever reason, not be here tomorrow. 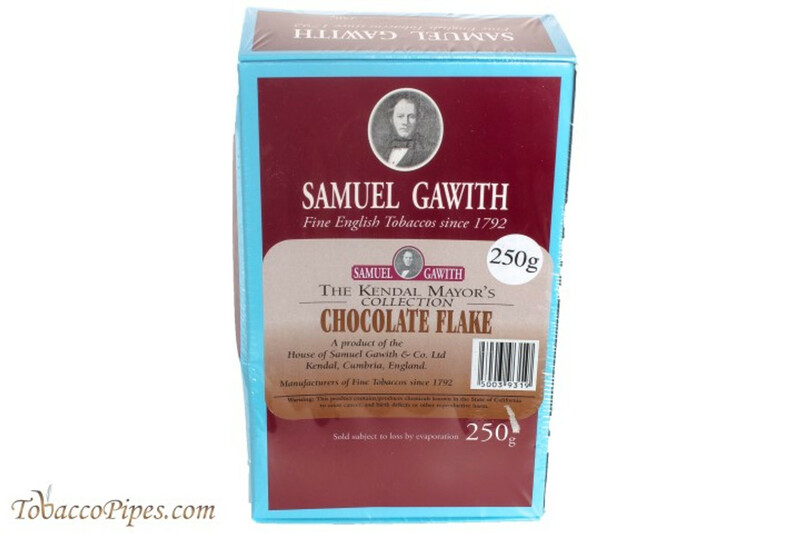 Tobacco Pipes, though, does have a very good price on these 250g boxes of DG Mayors Choco Flake. And no sales tax and free shipping over $95. Since all the GH Brown Flake I had was smoked up, I needed something similar for my morning smoke, with coffee. Hopefully, these boxes of SG will hold me through till GH Brown Flake is back! This looks good, but I still have several jars of Stonehaven stashed away, so no need to investigate a new chocolate flake as of now. I have had much of my cellar for around a decade now, feel like I’ve barely made a dent. I honestly just don’t think I smoke as much as Goose, I think his cellar is a bit more justified because he burns through large amounts of tobacco quickly, I smoke smaller pipes less frequently and therefore do not require stockpiling in that scale. Think I will try to save it for a Christmas day pipe . . . I think you are correct in this assessment. I smoke large pipes and anywhere from 4 - 5 bowls daily. I have a deep cellar and even more, realizing the day all the McClelland will be gone. Two tins of Burley Flake #2, arrived last week, and I've already placed one of the tins in the mail to a fellow CPSer, who hopefully will enjoy either smoking it or blending with it, or both. sweetandsour wrote: Two tins of Burley Flake #2, arrived last week, and I've already placed one of the tins in the mail to a fellow CPSer, who hopefully will enjoy either smoking it or blending with it, or both. Nice, those C&D Burley Flakes are pretty strong if I remember correctly, good stuff! That makes me wish I had the space in a humidor for 20 cigars. I could totally go for that bundle. Alas, my cigars are housed in a 5-stick hardshell travel humidor. With still no signs of any other bulk Sam Gawith or Gawith Hoggarth tobaccos anywhere, while Tobacco Pipes still had some boxes of this, I got three more today. Like it a lot but I'm starting to smell like a Hershey's bar. I asked them how many boxes they had left a couple few weeks ago and they said 24 but I doubt they have many more left. Picked up some Two Friends Redwood and some H&H Black House using that “friendship” code that Russ put out.